Beautiful one bedroom apartment in Saundersfoot, close to beaches, harbour and village centre. The apartment is well equipped with high quality fittings, furnishings and a fully integrated kitchen. 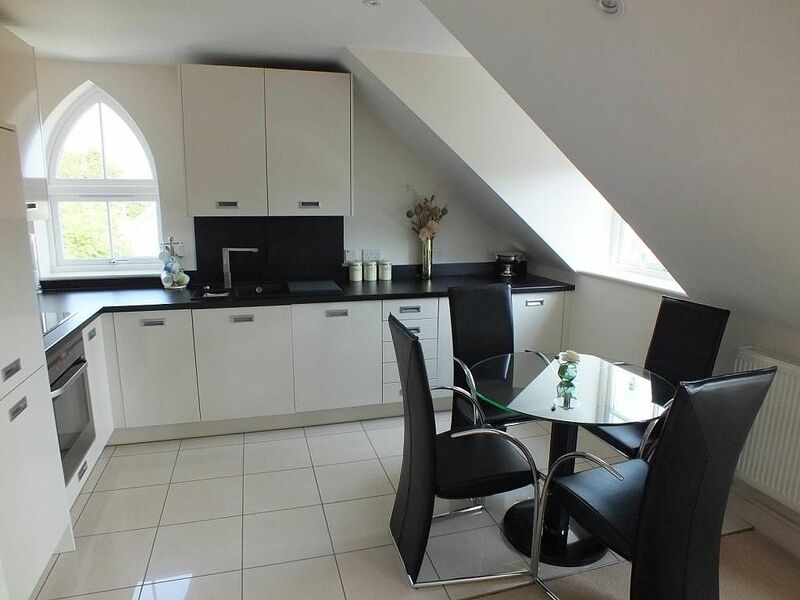 The kitchen/dining area leads into a comfortable, open-plan sitting room with coffee tables and television with DVD. The apartment benefits from an allocated parking space which is just outside the main entrance. The apartment is situated on the second floor of the building and is accessed via the main entrance on the first floor. The village, harbour and beaches are a short walk from the apartment and the renowned Pembrokeshire Coastal Path is within easy walking access. The apartment is strictly non smoking. No pets are allowed. Modern, tiled bathroom with high quality fittings, bath/shower over, wc and handbasin. Tea towels and Bed Linen provided. Comfortable lounge area with beautiful views from large picture window. Two settees, coffee tables, console table and flat screen TV and DVD player. Kitchen/Diner with dishwasher, washer/dryer, fridge/freezer and integrated electric fan oven and halogen hob. The dining area includes a glass top table with 4 high back chairs. Conveniently situated for the classic links course at Tenby Golf Club where golf has been played since 1875. It is renowned for its rolling terrain, beautiful sea views and excellent greens. Also close by is the parkland course at Trefloyne. Notes on accommodation: Saundersfoot is a small bustling village lying at the foot of a picturesque wooded valley with an attractive harbour and extensive sandy beaches. The working harbour and Saundersfoot Bay offers some of the finest sailing waters in Wales. Boat trips run regularly from the harbour for fishing and viewing the marine wildlife and coastline. The resort town of Tenby is within 10 minutes' drive. Cleaning / Towels / Linen / Maid service: Bed Linen provided and changed fresh for each stay, apartment fully cleaned before your stay. Please bring your own towels/beach towels. Other: The apartment has generous storage space including a coat cupboard in the hall. Excellent apartment, beautifully clean and well equipped. Great for walking and discovering the surroundings. The apartment was very modern and well equipped. Comfortable and spotlessly clean. Perfectly situated for us, as it was just a short walk into town. We parked our car and didn't move it at all for the few days we were here. The owner, Adrian, was very welcoming and friendly, even providing Welsh cakes for us to enjoy on arrival, which were delicious. A lovely touch. Would definitely recommend and will return again ourselves, hopefully for a longer break next time. If I had one criticism, it would be the size of the bed, but only because I am tall and used to sleeping in a king size bed. Adrain gave us very useful information beforehand via emails and when we met him at the property he was very polite and helpful. The apartment was situated on a hill above Saundersfoot beach which made it a lovely walk down into the town. The apartment was spotless and well presented and an information pack in the apartment told us all the interesting places to visit and numerous restaurants to try. It also had a bus timetable which was very useful (only downside we could not use our bus pass!). Saundersfoot is a very nice town with a lovely beach giving access to the costal paths, which we walked every day. Our favourite walks were Tenby town and their beaches and the village of Amroth in the opposite direction. Exceptionally furnished and spotlessly clean. Ideally placed for all local amenities and beach. Made very welcome by Adrian. Lovely clean apartment, friendly host and great location. We thought we would give self catering a try as we have become frustrated with bed and breakfast. The apartment gave us great flexibility and a comfortable place to sit and escape the rain. Short walk down hill into the main part of Saundersfoot where there was numerous restaurants to choose from, the hill back up may be trying for some, but not too bad. The apartment was very clean, had everything we needed, the main road was quite noisy if you opened a window, but with the windows closed we were unaware of it. Lovely touch of homemade welsh cakes left by the owners on our arrival, very delicious. Would definitely recommend this apartment for a stay in lovely Saundersfoot. Apartment is within half a mile of the harbour and beaches. Saundersfoot provides easy access to the spectacular coastline of Pembrokeshire. There are large sandy beaches and a harbour in the village so it is easy to relax or enjoy watersports or fishing. Saundersfoot is also superbly located for access to Tenby and St. Davids for day trips. Bustling Saundersfoot is well served for bars, cafes and restaurants serving local produce. The apartment is only a 5 minute walk from the lovely St Brides Spa Hotel. On arrival, a security deposit of £25 is required, refundable on departure. Changeover Day: Saturday is our normal change over day, departures before 10 am and arrivals after 3 pm. However, we do try to accommodate arrival and departure days to suit your requirements.